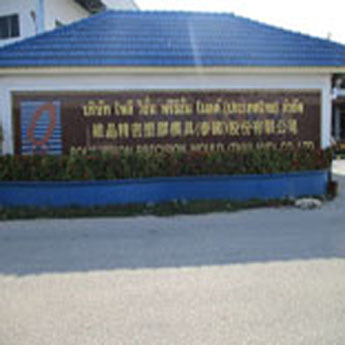 Poly Vision Group Co., Ltd., the second largest mould maker in Thailand that is specialized in making injection moulds and die press products. Decades of mould making experience and excellent mould machines have made them a competitive mold maker. Poly Vision was established in Thailand since 1995, as an expert in manufacturing plastic injection and mold in Chonburi. Today Poly Vision takes a leadership position in the field. Statistically, we are the second largest plastic injection and press manufacturer in Thailand and our main clients are Panasonic, Mitsubishi, Sanyo, LG, etc. Years of experience have made our injection mould and press highly competitive - that is, satisfaction is guaranteed. Due to our understanding of the essential importance of product quality, consistency and pricing competence, in 2007 we expanded our business with a press plant so that we could offer a complete line from designing, fabrication, mold making/die press, welding or silk screening to final assembly, testing, and even the production, organization management and scheduling for Unified Modeling. Software technology is to support, through the use of high-performance hardware, the formation of a running virtual manufacturing environment. For effective logistics management, the huge storage room, where clients store their materials has added a great advantage on fast production. Poly Vision has established one of the largest manufacturing and distribution networks in Thailand to facilitate just-in-time delivery to all its customers. Great injection moulds and die castings come from sophisticated molding machines. Poly Vision owns 34 plastic injection machines plus 26 machines that include CMM, CNC, EDM and die press, and 14 kinds of die press equipment to establish the capability of making various high precision press dies and mould making products. For professional certification, not only Poly Vision has ISO 9001:2008, we recently also obtained TS16949 to prove the ability on producing high standard auto parts. Plastic injection molding and auto parts die press are an exceedingly technical business and we are committed to provide the best services. Our customer service representatives and sales associates are continuously trained and educated in the areas necessary for complete customer satisfaction. We enjoy a long heritage of pioneering technological excellence and offer an unique and wide range of innovative and tailor-made solutions to customers in different regions. The main clients are including Hitachi, Sharp, Mitsubishi, Sanyo, Haier, LG, Samsung and Thai Summit. Poly Vision maintains leading positions in key markets through product differentiation, technical support and customer focus. The primary markets we serve include injection molding products, auto-part press parts, etc.